Tube feeders are hanging feeders that allow birds to feed through screens or ports. This arrangement keeps the seed fairly protected from the rain. Tube feeders have small perches that perching birds are attracted to. One advantage of a tube feeder is that it attracts the smaller bird species and prevents competition from larger birds. Some models have perches designed for birds that can feed upside down, encouraging birds such as goldfinches. One note of caution about tube feeders is that you need to make sure that unused seed does not sit in the bottom of the feeder and rot – it should be cleaned out regularly. The Gardman Heavy Duty Bird Seed Feeder has a nice contemporary design and should look good in any garden. It is of a robust construction using die-cast alloy, stainless steel and polycarbonate. This feeder has 2 ports but a 4 port Gardman feeder is also available. This feeder is easy to fill and clean and can be disassembled using the allen key provided. Its feed capacity is 420g. There are cheaper versions available of this feeder size, but it is a very solid design and should last for a long time. and finished with a nice powdered coating. a great robust high capacity feeder with virtually no negative aspects. This time we have a peanut feeder from the reliable Gardman company. This is a nice looking peanut feeder. It is made of polished die-cast aluminium, so it certainly is a shiny article. It is 30cm in length, holds 270g of peanuts and comes apart easily for cleaning. There is some variability in one aspect of this product; some purchasers note that it rusted all too easily, but this opinion is not universal and disputed by some buyers. Overall, a sturdy peanut feeder but with some caveats. 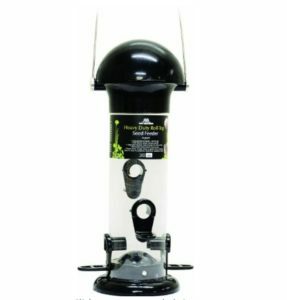 The Kingfisher Deluxe seed feeder made by Bonnington plastics is one of the best sellers and is also a very reasonably priced article. One note of caution must be borne in mind: the feeder looks metallic, but is actually made of very durable silver coloured plastic. If you have a squirrel problem, this may make you pause for thought as squirrels can chew through some pretty tough materials. The feeder is 36cm tall, so has a good capacity and most people seemed reasonably pleased with their purchase. An attractive feeder – probably worth trying. This is a lovely little bird feeder made by the reliable Gardman company. This has a different design to most tube feeders featuring perches and holes in the side of the tube to extricate the seed. A nice sturdy tube feeder, made of metal, with an easy to remove top with a twist action. This product has a hygienic biocide coating and a substantial capacity of 450g of sunflower hearts. Purchasers of this product note that it takes some time for the smaller birds to get used to it but once they do, they love it! Its design keeps the larger birds from feeding from it, and its sombrero hat shaped roof keeps the seed dry. tough ultraviolet polycarbonate tubing with metal fittings. one which will feed the smaller birds.